Orthotic support for little feet! Footlogics Kids is a medical-grade 3/4 length orthotic for young children who require biomechanical support for flat feet or excess pronation. All toddlers have flat feet, however by the age of five, the arches will start to develop. In some children, however the foot remains flat and the ankle joint rolls inward. This condition is called excess pronation and it is quite common. Excess pronation causes the child to develop an unnatural gait pattern. As a result conditions such children's heel pain (Sever’s Disease), children's knee pain (Osgood-Schlatters disease), general foot pain, ankle pain or aching legs may occur. Growing pains are more severe in children with excessively pronated feet. 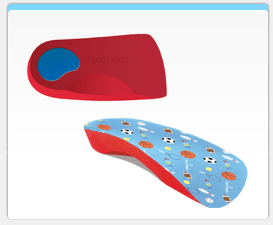 Footlogics Kids orthotics are a medical-grade orthotic designed to provide biomechanical support and restore the child’s natural walking pattern. Footlogics orthotics for children are safe to use, however if your child suffers from a major foot deformity or particular illness or medical condition, we recommend you consult your family physician first, before using Footlogics.